So last Sunday was the grand launch of The Atmosphere, a new shopping district that's located at Sri Kembangan. A little bit out of the usual spots but it's worth the trip I promise you. It wasn't just any grand launch, besides just the usual speeches and ribbon cutting, The Atmosphere had a collaboration with 20 International and Local artist who lent their skills in creating over 80 murals around The Atmosphere. It wasn't any ordinary murals but rather eye catching ones in 3D that seems to be the 'in' thing right now, especially if you remember the murals that were widly popular in Penang a few months back. The local and international artists that were invited to paint the 3D Street Murals, was surprised to see a former schoolmate in there. A very cool B&W artwork complete with a vintage mini cooper! The Mermaid mural, taken at the vantage point, which gave it a water background. The jump shot. My favorite picture out of all that day. An artwork inspired by Alice in Wonderland I *think*. Taking a bite out of the forbidden apple. Not sure what this artwork is suppose to be, I suppose a torture laboratory of some sorts? The space ship, was suppose to be a nice pose but April had to take an important call halfway. Although we took a lot of photos that day I'm only able to show just a few of it without overloading the page. If you would like to see the rest of the photos click : here although I would advise you to visit the place yourself to see the murals, and so happens there is a petting farm just outside The Atmosphere that you can visit aftwards. My attempt at balancing the plates on sticks. A hub for the arts, culture, nature, lifestyle and community, the retail lots at `The Atmosphere’ are ideal for specialty stores, showrooms, boutiques, bistros, cafes, restaurants and banks. The wide boulevards, meanwhile, are perfectly suited for weekend kiosks and flea markets, with their aura of lively energy. 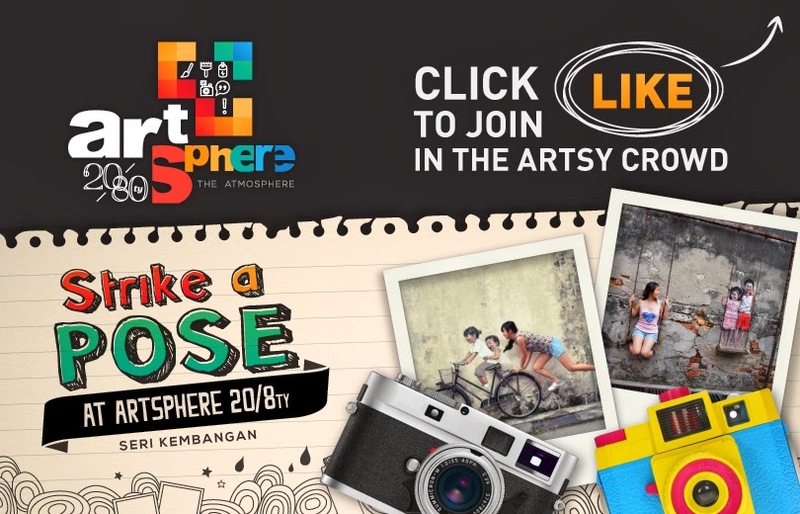 Of course, if you're already going to be taking pictures with those mural arts, why not just submit your best photo for this contest to win cool and outstanding prizes with a total worth up to RM15,000! Just visit https://www.facebook.com/artsphere208tyofficial for more information.